The WAVEFORM HS digital point-to-point MW radio system is designed to address universal applications on both Ethernet and PDH platforms and is ideal for the video streams distribution. 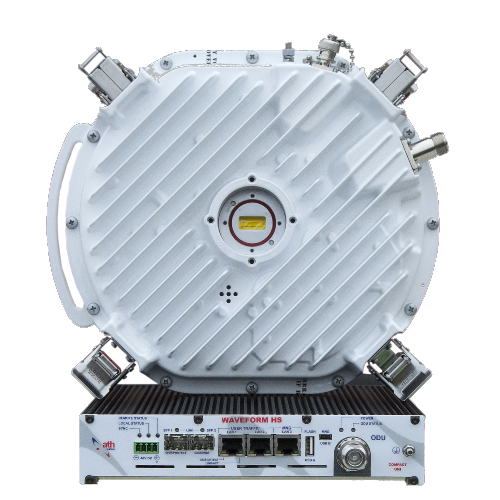 The system operates in the 6 – 42 GHz licensed frequency bands at up to 370 Mbps throughput (full duplex) in basic 1+0 configuration. Via software keys the user can upgrade the capacity to full throughput and implement additional options (IEEE 1588 clock synchronization, AES Encryption,..) any time in the future when they are needed. Thanks to EMM extension modules the user can scale the pure IP radio system with additional interfaces (e.g. up to 16x DVB-ASI ports for HD video broadcasting and up to 64x E1/T1 ports for TDM applications) when the service is requested at the optimal costs. Professional parabolic antennas in standard diameters and common frequency bands are available to build the complete microwave system and meet individual application needs. Antennas are available in 0.3 , 0.6 , 0.9 and 1.2m diameters based on frequency band. Complete sort of accessories such as AC/DC Power supplies, cables, surge arresters, etc. are available to provide the turn-key system solution for our customers.